It's people who make a city or region prominent. Aaron Burr Sr. (1715-1757) was a descendant of a distinguished early American family that came to these shores in 1630 with Massachusetts' Governor Winthrop. They subsequently settled in Connecticut. In school, the older Burr studied classical languages, but turned to theology. He was called to preach at Newark's Old First Church on December 21, 1736. While in Newark, he accomplished three things: He was the minister of Old First; he established a grammar school for boys, and he was tutor and later president of the College of New Jersey. As a skillful preacher, Burr soon attracted a large audience. One observer found him 'far in advance of his years by the brilliancy of his preaching and his interpretation of the scripture. He was able to hold a congregation spellbound for hours.' The church in which Rev. Burr ministered was not the handsome Georgian building that now stands on the eastern side of Broad Street across from Branford Place. That is the third and present building, completed on Jan. 1, 1791. Burr's church stood across the street from today's church, built circa 1714-16 of stone and capped with a steeple and bell. The Rev. Dr. MacWhorter called it 'the most elegant edifice for public worship at the time in the colony.' The Burr pastorate also was significant in that it marked the formal separation of church and state, a monumental decision in light of the fact that Newark had been established as America's last Puritan theocracy in 1666. As a teacher, Burr attracted young men to his classical grammar classes. In 1752 he published the Newark Grammar, which was widely used by classical scholars. 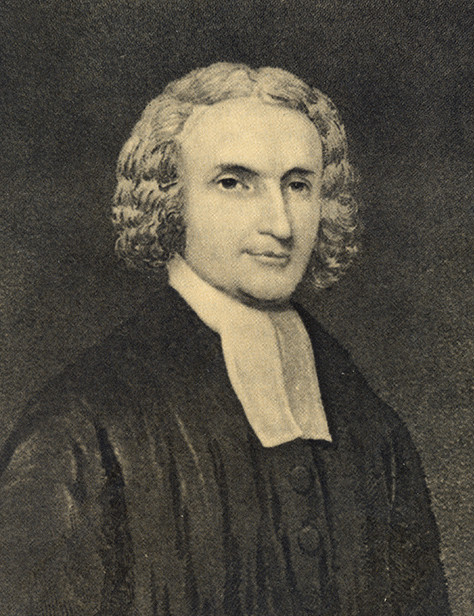 In 1747, Jonathan Dickinson, minister at Elizabethtown, assembled a group of students in his home and consequently founded the College of New Jersey. His untimely death within a few months resulted in the school being transferred to Newark's Old First Church under the leadership of Aaron Burr Sr. For nearly a year, Rev. Burr conducted classes in Newark. On November 9, 1748, he was elected the young college's second president after the school was formally moved to Burr's parsonage. This move made Newark the home of the College of New Jersey. Admission to the college was difficult. Each student had to be able to translate Virgil and Tully and was expected to continue his studies in Greek and Latin, the elements of mathematics, natural philosophy, rhetoric and logic. In 1750, Thomas Shippens wrote his father that he was studying the works of Xenophon in Greek, and Watts' Ontology. And that he read Cicero de Oratore and recited Hebrew grammar. 'And beside these things, we dispute once a week after the syllogistic method; and now and then we learn Geography.' During the period the college was located in Newark (1748-1756), it graduated 90 students. Burr dedicated himself almost exclusively to the care and development of the fledgling college. As New England nurtured Harvard and Yale and Virginia supported William and Mary, New Jersey, and briefly Newark, maintained the College of New Jersey for the training of its theological, legal and political leaders. As the college's president, Burr was responsible for raising money and keeping the institution's doors open as well as the classroom filled with tutors and students. This meant money, so naturally he went about raising all he could in whatever way was available to him. Since the province would not allow a lottery, Burr visited many possible donors. No sooner had the Burrs relocated to Princeton than young Aaron and his sister Sarah were orphaned. Their mother passed away within a few months of the minister. While the children were placed under good care, they were denied the loving comfort of a family environment. Entering school at a very early age, Aaron Jr. began to study theology but switched to law. When the Revolutionary War began, he served in the Continental Line until health forced his return home. After the war, he moved to New York, where he began his political career and lifelong association with Alexander Hamilton. Twice Burr was elected to the U.S. Senate from New York, and once to the New York Assembly. In running for the presidency, he and Jefferson tied, each receiving 73 votes. The final ballot went in Jefferson's favor, largely due to Hamilton's efforts to damage Burr's public image. According to the custom of the time, Burr, the loser, became vice president. After 15 years of contests with Hamilton over the presidency, the New York governorship and the Senate, Burr felt a particular victim of Hamilton's malevolence. A duel took place July 11, 1804, at Weehawken. Each man fired a single shot. While Hamilton claimed he had fired into the air, a recent examination of his dueling pistol revealed a special advantage over Burr. Over the years, historians have continued to vilify the vice president. Hamilton was dead and Burr was ruined politically. The remainder of Burr's life was generally an unhappy one, with the claim that he was hatching plots for a western empire along the Mississippi River. He was tried and found not guilty of treason. Even a deathbed denial of any separatist activity on his part failed to clear the Newarker who came within one electoral vote of becoming the third president of the United States. Last month, in downtown Newark, Donald Karp, president and CEO of Broad National Bank, a longtime member of the Aaron Burr Society of America, celebrated the 242d birthday of Newark-born Aaron Burr Jr. and recognized the site of his birth as well as his contributions to the American saga. Newark's newest historical plaque was unveiled to celebrate this event in the lobby of the bank — just a few feet from the site of the former parsonage of Old First Church and of the College of New Jersey. The college became Princeton University after it moved from Newark in the 1750s.